With all the boating opportunities in Nevada, it's no wonder there is so many boat dealers throughout the state offering a wide variety of boats for sale. If you like to sightsee, cruise, fish or water ski, there are dealers with your dream boat for sale. To locate a dealer near you, first select a quadrant of the state. Then find a boat dealer listed by proximity to cities, waterways, campgrounds and attractions in NV. Some of the major cities we have listed for your convenience include Wells, Surprise Manor, Hawthorne, Reno, Walker Lake, Carlin, Henderson, McGill, Spring Creek, Carson City, Beatty, Gabbs, Kingsbury, Tonopah, Winnemucca, Bullhead City, Elko, Las Vegas, Mesquite and Fallon. Nevada boat dealers are familiar with boating requirements in NV. They can easily assist you in selecting the right boat for your intended use, as well as make suggestions for boating safety and ways to keep operating costs to a minimum. 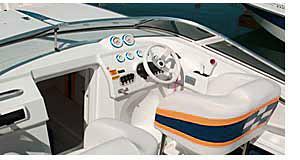 Most of these boat dealers offer new and used boats in many styles and configurations. 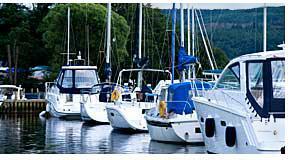 You can find fishing boats, deck boats, pontoon boats, bow riders and party boats. Some boat dealers may also offer bay and offshore boats for larger bodies of water and coastal use. Once you acquire the ideal boat, we'll help you find places to boat in Nevada. Lakes are listed by quadrant within the state for convenience. The list of major lakes includes Lake Phyllis, Ruby Lake, Lake Lahontan, Lake Tahoe, Wilson Reservoir, Artesia Lake, Pyramid Lake, Rye Patch Reservoir, Horseshoe Reservoir, Lake Mead, Washoe Lake, Chimney Reservoir, Wild Horse Reservoir, East Peak Lake, Mud Lake, Peterson Reservoir, Walker Lake, Crystal Reservoir, Lake Mohave and Topaz Lake. Rivers too can be a fun place to go boating and are listed by quadrant also. Some of the major rivers we've identified include Carson River, Walker River, Hubmoldt River, White River, Rock Creek, Marys River, Virgin River and Quinn River. Throughout NV you may find manufacturers of boats, trailers or boat accessories including Bright Star Manufacturing and Dry Dock Boat Sales. Boat types commonly used on NV waters. If you are looking for a specific type boat, we may have information for you. Some of the boat types we cover include sailboats, pleasure boats, family boats, pontoon boats, cruisers, fishing boats, bass boats, speedboats, inflatables, jon boats, cuddy cabin boats, canoes, car toppers, ski & wake board boats, deck boats, aluminum boats, electric boats, jet skis, personal watercraft and fish-and-ski combos. We'll help you find the boat, waterways and resources to make owning or renting a boat in Nevada an absolute pleasure. For further information about boat registration in Nevada, contact the Nevada Department of Wildlife - Boat Licenses located at 1100 Valley Road, Reno, NV 89512. The phone number is 775 688-1500.